How to get there The real climb from the east starts in Linthal (660m) and it is from start a hard climb, but then you reach a plateau (Urner Boden) where it is almost flat for several kilometres. Then it is steep again to the top. The climb from the west in Altdorf (488m) is similar in steepness and length. The road descends a little on the way up at Unterschächen (1050m to 994m). 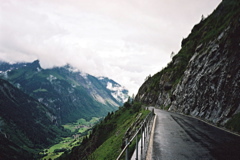 One could also climb up the Schächental via a higher road from Spiringen to Urigen, but it has a slightly longer descent. It is a special pass with a character of its own. It feels like it is one of the truly oustanding big passes of the Alps, in the category of Gotthardpass, Simplonpass, Col du Gd. St. Bernard and others, but it is far less used and less known. The roadwork is quite nice. There are cobblestone pavements in some bends lower down near Linthal (only at the start now in 2015). You will not find many tourists here (maybe because it has been bad weather on both my visits). There are many local farmers in the upper valley. To me it looked like people were coming up here in the Summer, but that they almost all lived elsewhere (as the houses seemed like bad shelters) – impressions from my first visit (saw no people up there below the pass in 2015, but both times rain so could hardly see anything). (This seems to be common in most parts of the Alps, but obviously some also lives here the year around down in Urnerboden, that is.) I visited it on a very rainy day, so that might have made it appear even less touristic (yes).